The change is rather minor, with a black design and a few other refinements to give the headset a sleeker look. 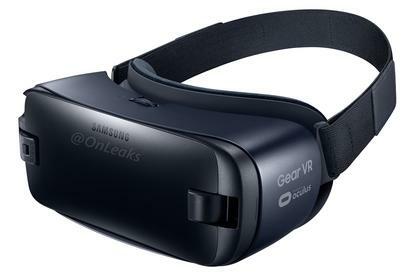 If you’ve yet to grab a Samsung Gear VR headset, you may want to wait a few days. According to the usually reliable Steve Hemmerstoffer, who drops renders and other goodies from time to time under the handle @onleaks, a new headset is imminent. His tweet also included Note 7 renders, which have been available aplenty in the weeks leading up to the launch. The black design is pretty sleek, with the visor more flush than the current model. This image also doesn’t show a strap that goes over the top of the head, but it’s likely that it just isn’t a part of this render. One horizontal strap probably isn’t enough to keep a headset on securely. The big question is whether it will be backwards compatible with previous Galaxy phones, since the Note 7 is likely to have USB-C instead of microUSB. It might be possible with an adapter, and would make the new headset an appealing buy to those who aren’t yet planning on upgrading their phone. The story behind the story: The answer to such questions will arrive next week at the Samsung Galaxy Unpacked event on Aug. 2. Along with showing off the new Galaxy Note 7 (Samsung’s skipping ahead from the Note 5), we should see this elusive new headgear. Check in with us on Tuesday for all the juicy details.